On my first night in La Paz, I walked into my dorm room to find a girl quietly sitting on one of the beds. I moved to introduce myself, as is dorm room etiquette, when I noticed she was missing at least three front teeth and that her face was badly bruised. I tried not to look taken aback but couldn’t resist asking what had happened. On my second night in La Paz, I was drinking White Russians with a tall German who had his arm in a sling. We were talking about girls, as is backpacker-bro etiquette, but the conversation inevitably turned to the backstory of his injury. On my third night in La Paz, against all logic, I found myself in a tour agency, booking a trip to Death Road with a few friends. As I signed waivers and was fitted for safety equipment, I noticed a small typed paragraph on the wall, among the pictures and posters. Moving closer, I began to read what turned out to be a eulogy. Of an Australian. Who had recently died biking the Death Road. With this very tour agency. To be fair, the eulogy absolved the agency of all responsibility. Yet, as you might imagine, it still added to my unease. 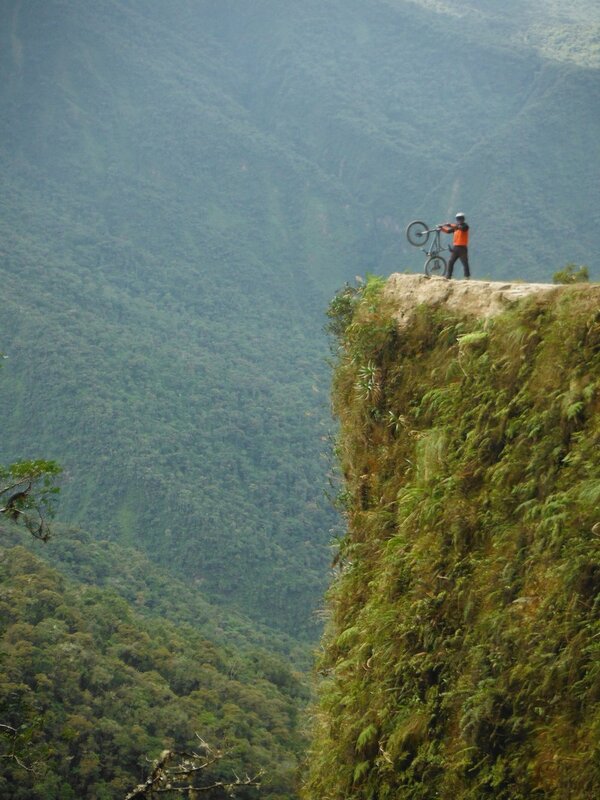 Death Road has taken thousands of lives in its history, at least of 20 of them bike riders. Crosses dot the cliffs, paying testament to the literal fallen. It is a uniquely 3rd-world phenomenon – an incredibly dangerous hazard to the community in a place too poor for anything significant to be done about it. Dozens of Bolivians have died on Death Road every year for the past 70 years and most of the route still doesn't have guardrails. It’s almost as if some sort of macabre calculation has been done and this terrible cost has been found to be somehow acceptable. A new route has recently been built – but there’s been a landslide. So the drivers have returned to Death Road. Which is now filled with gringo thrill seekers. Looking over the cross-dotted road from the top of the mountain, one can’t help but think how hard it must be to live in a place this poor. They should have closed this road to traffic a long time ago. There should have been an inquiry, not that it wasn't obvious, about how dangerous a narrow, unpaved road lined with 100 meter drops is for large trucks and buses. There shouldn't be anyone still dying in such an obviously deadly place, not in this century. But drivers can make a little more money if they take this shortcut and the government has enough other issues on its plate. There is a simple reason I personally decided to ride the Death Road, besides the pure, Mallory-esque-“Because it’s there”-appeal of the activity. That reason is control. Biking, unlike skydiving or bungee-jumping or a variety of the other “extreme” backpacker options, offers the adventurer a high degree of control. Your safety is in your own hands; you’re in full control of your own speed. I would not be trying to impress any girls with my cycling, or attempting to keep pace with my born-on-a-bike Dutch friends, or having any concern with being first down the mountain. I would take it slow, stay to the inside, pull over when I saw a truck, and make safety my first concern. And for the most part that’s exactly what I, and the majority of the group, did. I admit it can be easy to be seduced by your own imagined skill on a bike and start riding a little too fast. But there are constant reminders – memorials, wooden crosses, large boulders – of how the road got its name. They ground you in the dangerous reality of what you’re doing and you happily slow down. There is actually relatively little danger of falling off the cliffs if you stay far on the right, you soon start to worry more about smaller potential tumbles caused by rocks, rather than going over the side. It’s only after, when you look back up at the twisted, narrow path that you fully process your “accomplishment”. At the end they give you a shirt that says “I survived Death Road”, which is the wrong word to use. You paid to put yourself in harm’s way for fun, you simply “completed” it, if anything. Only retired Bolivian truck drivers, if they ever do retire, truly “survive” Death Road. But you feel accomplished wearing that shirt nonetheless. You go back to the hostel, and everyone asks how it went, and you act nonchalant. And then you can’t help but use that wrong word.